Beauty is in the eye of the dreamer, and anything you dare to dream can become reality. This dream is coming true for Cassandra Laessig, of Wakefield, MI, as she will graduate with a Certificate in Cosmetology with high honors on Friday evening, May 12, 2017, at Gogebic Community College. Her dream of becoming a hair and makeup artist for fashion, photoshoots, music videos, and films continues. Laessig, born and raised in Wakefield, MI and a 2015 graduate of Wakefield-Marenisco High School, started her journey at Gogebic Community College in the Fall of 2015 in the Art program. Laessig changed majors in January of 2016 to pursue Cosmetology, which she also enjoyed. “Makeup allows me to combine cosmetology and art - which is perfect; makeup is art on a live canvas.” said Laessig. “It has been both an honor and a privilege to have such an outstanding future-professional attend the cosmetology program at GCC. Cassy is an amazing young lady who portrays a high level of commitment in everything she does,” said Nicole Hocking and Laura Erickson, GCC cosmetology instructors. Laessig has always had a passion for applying makeup. However, it wasn’t until one Halloween that she discovered special FX makeup which is a process of using prosthetic sculpting, molding and casting techniques to create advanced cosmetic effects. Laessig said that she took out the makeup and self-taught herself how to create fake wounds on her and a friend. Ever since then, people have been encouraging her to pursue a career in makeup. Laessig then began doing makeup for others, including transforming humans into zombies for the annual Zombie Run at Mt. Zion. She even instructed a zombie makeup “101” class on how to properly apply and remove special FX makeup. “Cassy is a breath of fresh air, a genuine student who takes our exciting profession to the next level,” said Hocking. In her free time, she initiates, directs, photographs and arranges her own photo shoots for both beauty and special FX hair and makeup. Last Spring, Laessig was discovered by Matt Torres, Film Writer/Producer of the 2016 indie film “Moses,” which has not been released yet. Torres found her work on social media and immediately reached out to her. Laessig agreed to the film and had an all-expense paid trip to Chicago for two weekends this past summer. She was the onsite special FX makeup artist and applied makeup and prosthetics per the script. “Participating in this movie enabled me to meet and network with various actors. I learned that makeup plays a huge role in movies,” said Laessig. Torres told Laessig that without her skills the film would not have been as effective. Cassy’s future plans include attending the Make-up Designory School in Burbank, CA to pursue courses in fashion, beauty, special FX makeup, and hair styling for photoshoots and movies. She plans to relocate sometime in June and hopes to work as a hair and makeup artist for the entertainment industry. “Cassy has set a high standard for others to follow and has not only met, but exceeded, any expectations and goals with enthusiasm. We are certain that she will have an exciting career in cosmetology and that she will strengthen and enhance the profession,” said Hocking and Erickson. Her advice to others is to “Dream big! Cosmetology is a great field to get into as there are a ton of different avenues you can take. Nicole and Laura have been very encouraging in telling me to go for it. They have both taught me a lot,” said Laessig. In Laessig’s spare time, she has volunteered for numerous projects in her hometown including painting a 24 by 8 foot mural for the City of Wakefield as well as a statue for the Wakefield Fire Department. She also volunteered at the Taste of Gogebic Range, the Manito Art League Art Show, the Range Suicide Prevention Walk, and Historical Ironwood Theatre’s Idol performing hair and makeup on contestants. She has also served as an intern at the Downtown Art Place and graphic artist for the Chieftain student newspaper at Gogebic Community College. Some of the awards that Laessig has won include the following accolades: Student Cosmetologist of the Year, Perfect Attendance in Cosmetology, Long Hair Design Winner, Community Role Model and Artist of the Year and Month to name a few. “Cassy is one of the kindest, most honest, considerate, dedicated and creative team members. We wish Cassy the best in her bright future and we are extremely excited and proud to follow her success,” said instructors Hocking and Erickson. Laessig’s family and friends have been very supportive of her dreams along with others. She is the daughter of Jeff and Regena Laessig, of Wakefield, MI, and she has two sisters. She is currently employed as a waitress at Ma’s Place Café in Wakefield and says that even the customers ask about her plans. 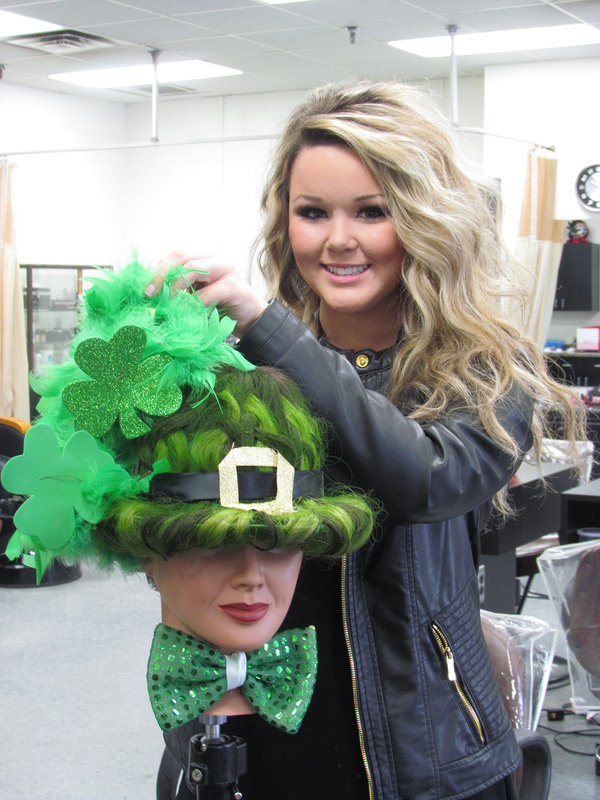 Laessig poses with her Cosmetology creation for a long hair design competition. Laessig preps an actor for an upcoming murder scene on the set of Indie film “Moses” in Chicago, IL.